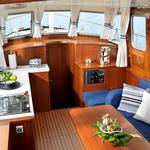 Frida M. (Sa) is a name of vessel Linssen Classic Sturdy 36.9 AC ,which was produced in 2014. You can rent her from port Zehdenick just a few kilometers from Inland. Frida M. (Sa) is equipped with 6 sleeping places. 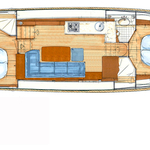 Beds on the boat are configured in 6 scheme. 2 bedrooms are placed inside the boat Frida M. (Sa). You can get other boats clicking here: Motorboats Inland. 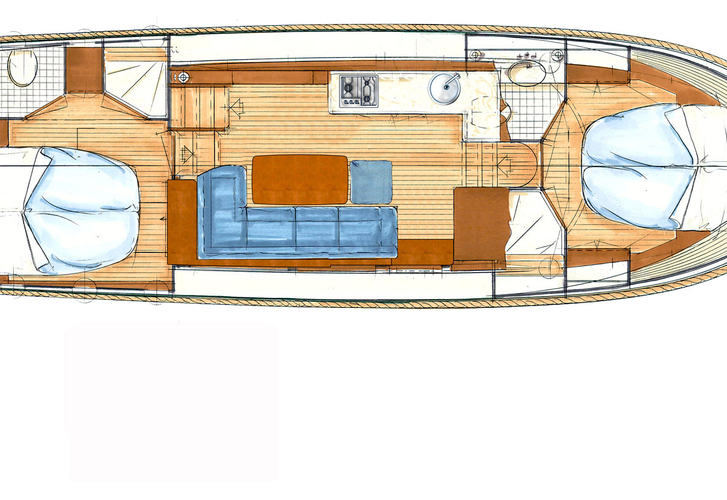 Guests can feel comfortable on this yacht , because there are 2 heads with showers for their disposal. With 360.00 l liters in tank for fuel you can sail really far and still be independent because of 300.00 l l. in tank for water. Frida M. (Sa) is powered by engine 75 hp. Vessel's dimensions are: lenght - 11.10 m , beam - 3.40 m and 1.00 m of depth. On the vessel you will find following equipment: Wc pump electrical, Inverter 12v-220v, Heating, Radio / cd player, TV, Bow thruster. . Caution accounts for 1000.00 EUR. In our search machine you can effortlessly check avalailability of vessel Frida M. (Sa) from Zehdenick following this link: Motorboats Germany.